Volleyball Injuries - How to Prevent Injuries? 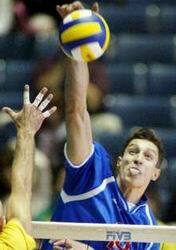 Read about volleyball injuries and how to prevent the most common injuries. 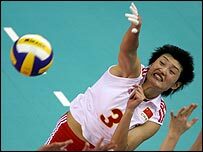 Volleyball Injuries - What is "Prehabilitation"? Before pre-season workout routines begin athletes should do more "Prehabilitation" exercises. It is important for athlete to do injury prevention training all year around, but it is the time when extra attention should be paid on muscular imbalances. In "prehabilitation" training athletes should do exercises, which help athletes to avoid injuries during intense pre-season workouts or games during the season. Hitting line over the shoulder. The idea behind injury prevention is to work on the muscular imbalances of critical body parts, like shoulders and knees. Basically training is just to make specific body parts stronger to keep the pain and injuries away. These following exercises are great to keep away the shoulder pain, which is one of the most common problems with volleyball players. 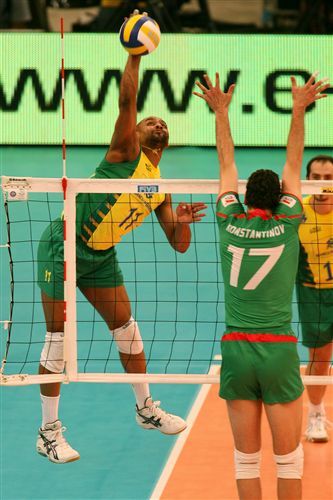 One specific problem with volleyball players is the imbalance of external and internal should rotators. During the pre-season training or matches on-season internal shoulder rotator is under heavy work load, therefore volleyball athletes should focus working on their external shoulder rotation to prevent injuries happen. 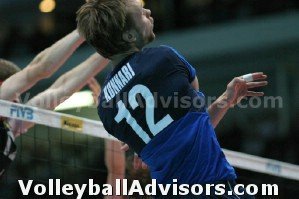 Volleyball Injuries - How to Avoid Shoulder Pain and Injuries? Use bench and a light weighted barbell. Alternatively use cables or rubber bands and perform while standing. Lie on the edge of the bench on your left side. Keep the right elbow on the right hip. Hold the weight on your hand. Keep your right arm on 90 degree angle. Let the weight "hang" down. Lift the weight towards sealing by keeping your elbow on the hip. Lift slowly as high as you can go. Then lower the weight slowly to the lower position. Then lift up again. Keep in control. Move the weight slowly. Use very light 1-10 pound (around 0,5 - 4kg) weight. Do the opposite for the left hand. Internal is the opposite exercise of the previous external exercise. Lie on the edge of the bench on your right side. Keep your arm in 90 degree angle. Have your right arm next to your right hip. (Basiclly the same thing than above, but now your arm is "under you".) Your right hand palm is towards sealing. Lift the weight up towards sealing keeping your right elbow on the right hip. Lower the weight again to starting position. Move the weight slowly. Keep a good control over it. Remember to use light 1-10 pound (around 0,5 - 4 kg) weight. Do the opposite for the left hand. How Often to Exercise? How Many Reps? You can carry out these kinds of exercises at least 2-3 times a week. You suppose to do them with very light weights, therefore you could do them everyday, if you like. Many volleyball players and teams use them as warm up drills for the volleyball practice, workout session or matches. Athletes get a good warm up - and perform important "prehabilitation" exercises at the same time. You should be able to perform up to couple of hundred reps, if you use light weights. Do 10-40 reps with each set. Standing up on regular position, your arms on the side. Hold the weight on your right hand. Lift up your straightened arm until the weight reaches your shoulder level. Lower the weight to the starting position. Move the weight slowly having a good control over it. Standing up on regular position, your arms on the side. Hold the weight on your right hand. Start lifting up your right arm backwards as far as it goes. (You can lift it up backwards only around half to one foot or 15-30 centimeters - depending on your flexibility). Lower it back to starting position slowly and repeat again. Sit on the ground, your hands resting on your side, palms towards the ground by your hips. Lift yourself up by pushing up with your arms your heels supporting the ground along with your arms. You may curve your upper body like a cat to have a better balance. Focus to maintain a steady position by tightening shoulders. Keep a steady position and hold up for 10-30 seconds. Rest a little bit. And lift yourself up again. You should be able to do at least few to 10 sets. Notice: If you have shoulder pain, which is typical for many volleyball players, you may feel some pain in the shoulder - especially while doing the Shoulder Press Up exercise or External Rotation exercise. Use common sense; if exercise hurts too much, it is probably better stop exercising and get help from the physician. Other critical muscle imbalances for volleyball players appears between groin and hamstring muscles. What can volleyball player do to prevent injuries before they happen? Best exercises to prevent injuries - and to get you in top shape for volleyball. Pros and Cons about Volleyball Ankle Supports. Why volleyball players use volleyball ankle support? Other braces are build to prevent injuries and others for recovery. How to choose between several ankle braces?